Normal vision occurs when light is focused directly on the retina rather than in front or behind it. A person with normal vision can see objects clearly near and faraway. Nearsightedness results in blurred vision when the visual image is focused in front of the retina, rather than directly on it. It occurs when the physical length of the eye is greater than the optical length. For this reason, nearsightedness often develops in the rapidly growing school-aged child or teenager, and progresses during the growth years, requiring frequent changes in glasses or contact lenses. A nearsighted person sees near objects clearly, while objects in the distance are blurred. 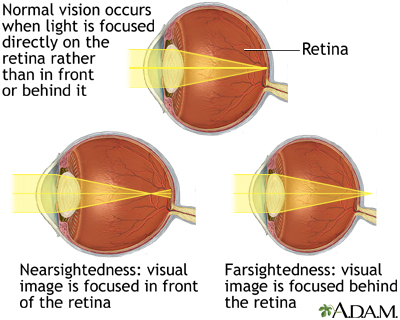 Farsightedness is the result of the visual image being focused behind the retina rather than directly on it. It may be caused by the eyeball being too small or the focusing power being too weak. Farsightedness is often present from birth, but children can often tolerate moderate amounts without difficulty and most outgrow the condition. A farsighted person sees faraway objects clearly, while objects that are near are blurred.